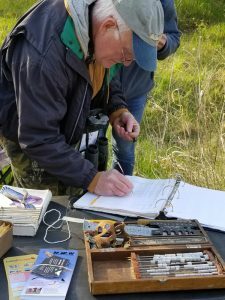 A number of lucky AVA folks walked in a beautiful forest, marveled at an ingenious dam structure and generally loved every minute of being outdoors on a cool, blue sky, early fall morning with Sam Burckhardt on Saturday, September 8, 2018. 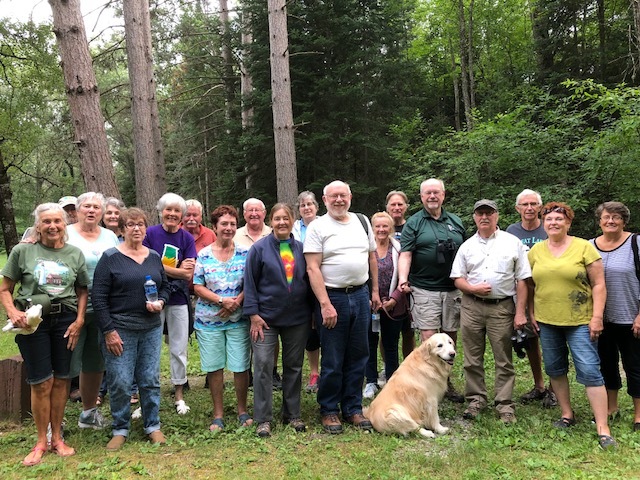 It was wonderful to be there to smell the fragrant soil and sweet fern, to see the towering trees and hear the birds and leaves rustle in the wind to believe it! 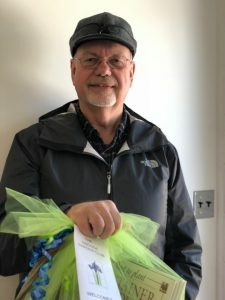 In addition, a fascinating history of home ownership and property acquisition was shared. Wow! Thank you BIG TIME to Sam and Richard for sharing their ‘Sanctuary” with AVA. 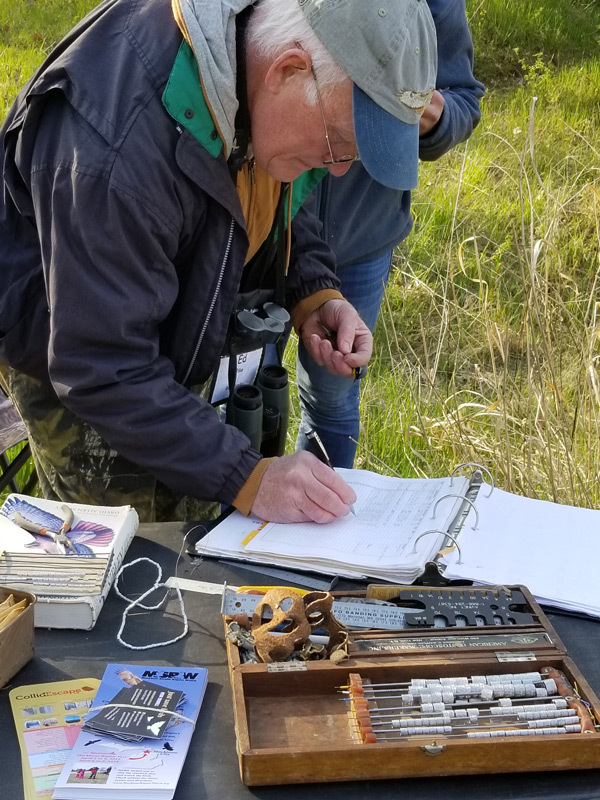 Our first unofficial activity of the new birding year took place on Friday, August 24 at Pine River Campground. It was a gorgeous mild evening, with very few bugs, and 20 AVA members. 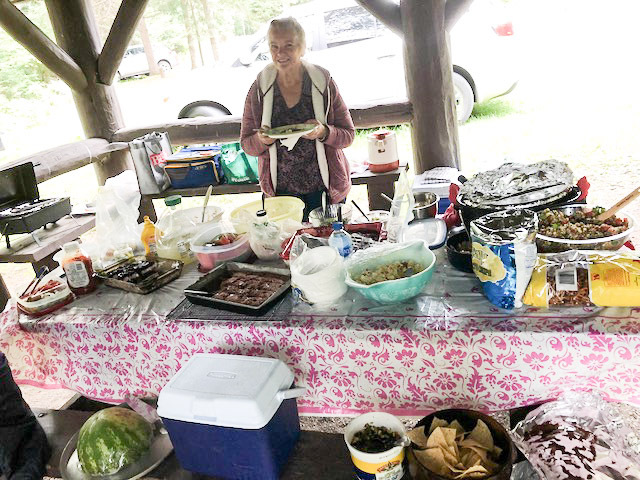  A veritable feast was enjoyed; complete with hotdogs, chips, many tasty salads and truly delicious desserts. It doesn’t get any better than that! A short, but pleasant walk to view the river followed the wonderful meal. 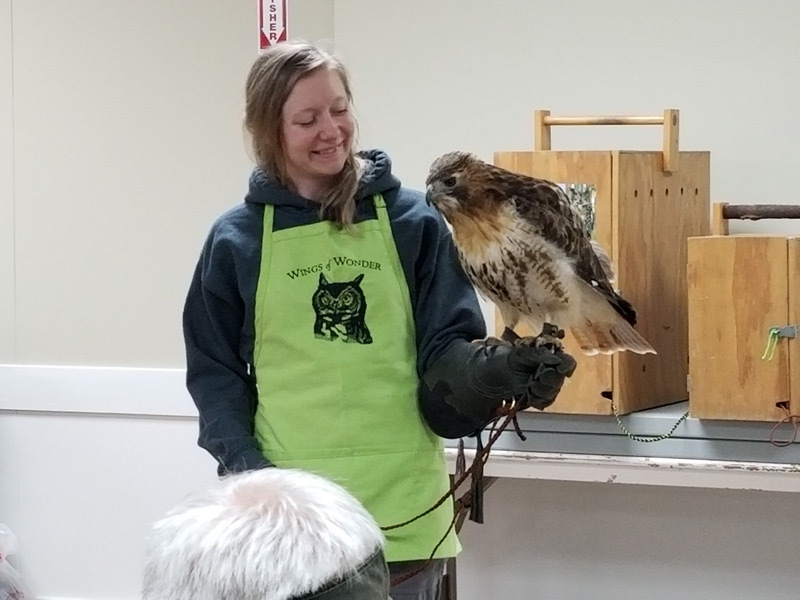 Arnie was able to share many interesting facts about the area due to its connection with Huron Pines and the Kirtland’s Warbler tours as well as learning about the trout fishery that was once active on the river. 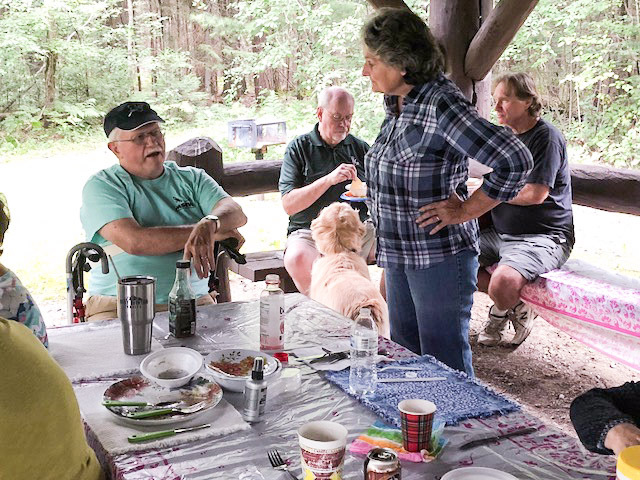 Gary Wall and Carol Wells camped the night proceeding our get together and had the place to themselves! It is certainly a beautiful and peaceful place to be. 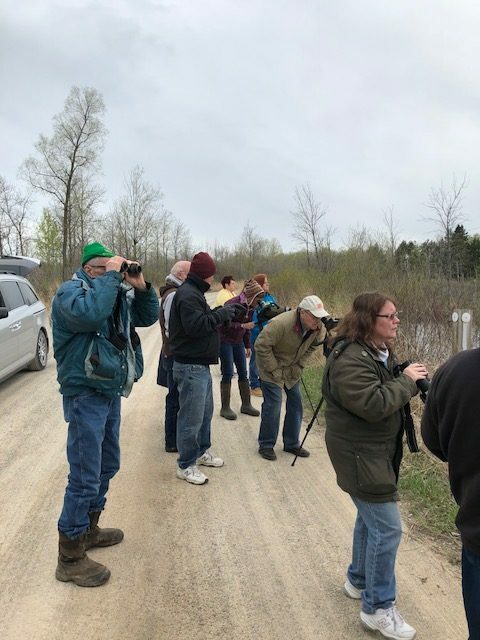 A few of us spotted Redheaded Woodpeckers and other birds on the drive to the campground. 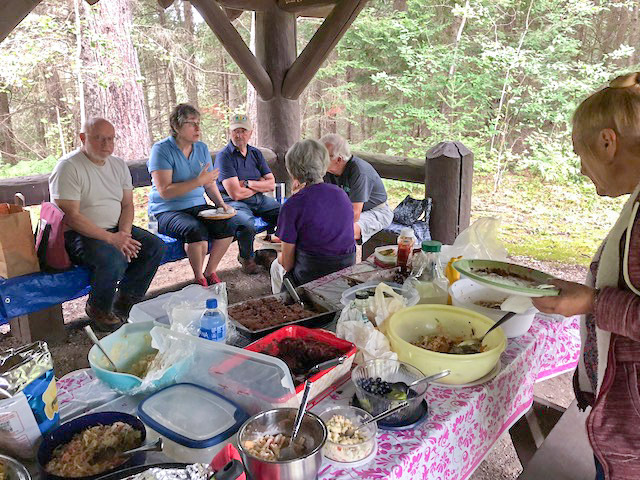 The enthusiastic conversations about birds, family, summer activities, upcoming trips etc. never slowed down until all departed by 7:15. I wish you all could’ve been with us. Hopefully, we will all be together on September 11, in East Tawas for thefirst official meeting of the new AVA birding year. This season proved to be interesting, challenging and rewarding. 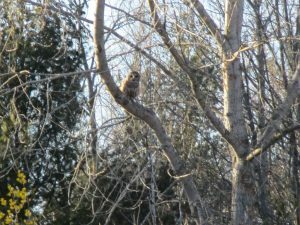 Interesting because this was the only known nest site on the Lake Huron side of the U.S. 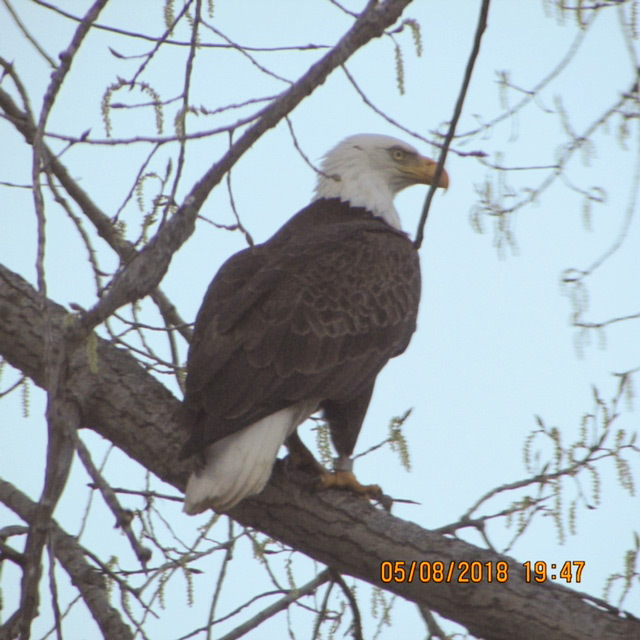 It was located on the beach just south of the AuSable River mouth in front of a condominium complex. The male was captive-reared last summer at the University of Michigan Biological Station near Pellston and the female hatched in 2017 on the west side of the state. Both were first-year nesters. 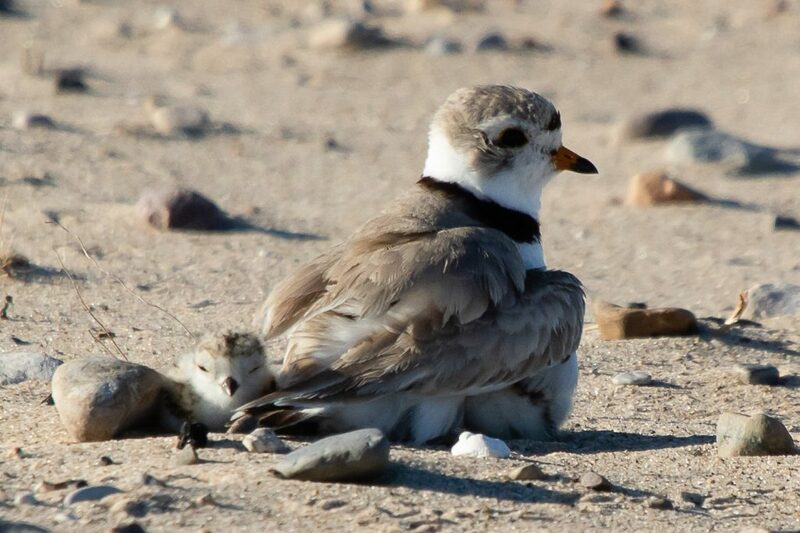 The female selected a perfect location to nest…high and dry along the beach. Throughout the incubation period, invading waves due to strong northeast winds failed to reach the precious four eggs. 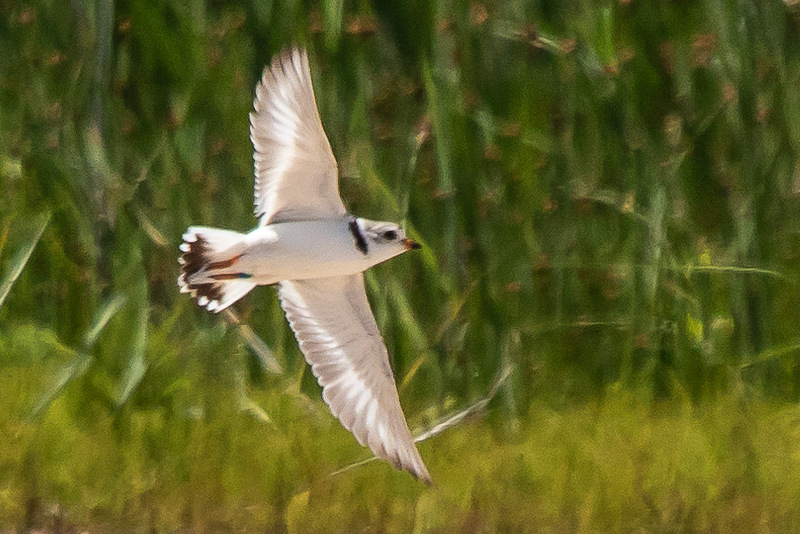 However, several natural predators including Ring-billed and Herring Gulls were constantly on the scene. 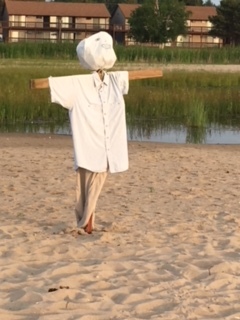 Condo residents were aware of the challenge the gulls presented to the remaining chick and after getting input from the plover monitors, decided to create their own scarecrow and placed it on the beach where most of the gulls gathered. After several days, “Gulliver” the scarecrow was most effective in keeping the pesky gulls away. 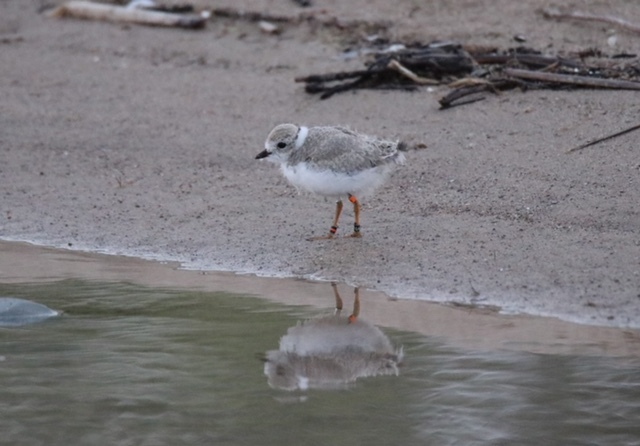 Survivor was banded and departed about three weeks after birth. Hopefully, it will be sighted on its wintering grounds and reported to researchers. 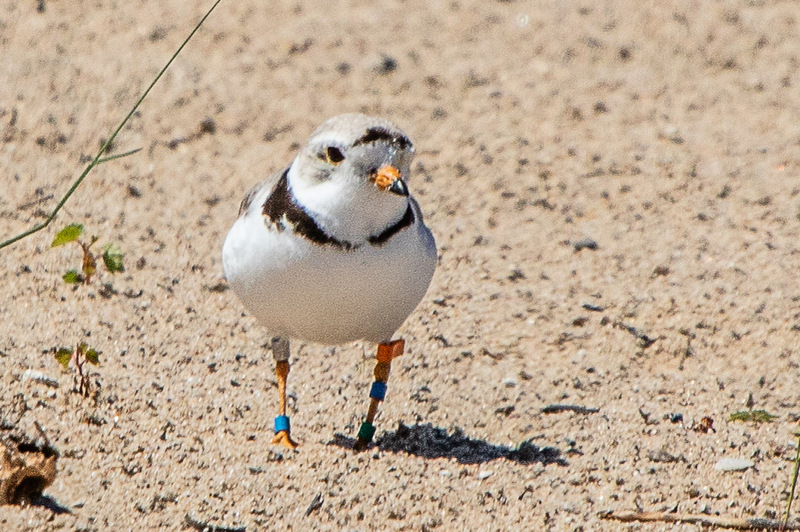 The parent female was spotted in late July along the South Carolina coast. 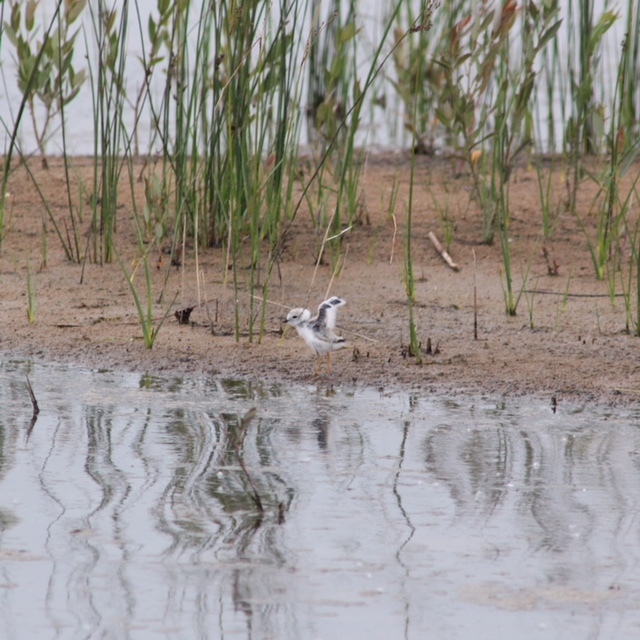 One of the rewarding moments during this season at this location was the sudden and brief appearance of a plover that was banded at Tawas Point in 2012! It still wore its “chick bands” and therefore has never nested or been re-branded as an adult. It was only observed that one but memorable day! 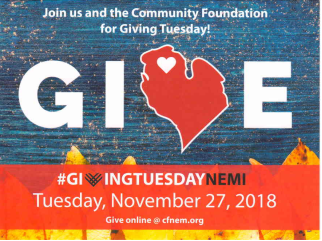 Many thanks to Arno Poerner, Arnie Leriche, Chris Coulon, Ed Cole, Phil Odum, R.C. 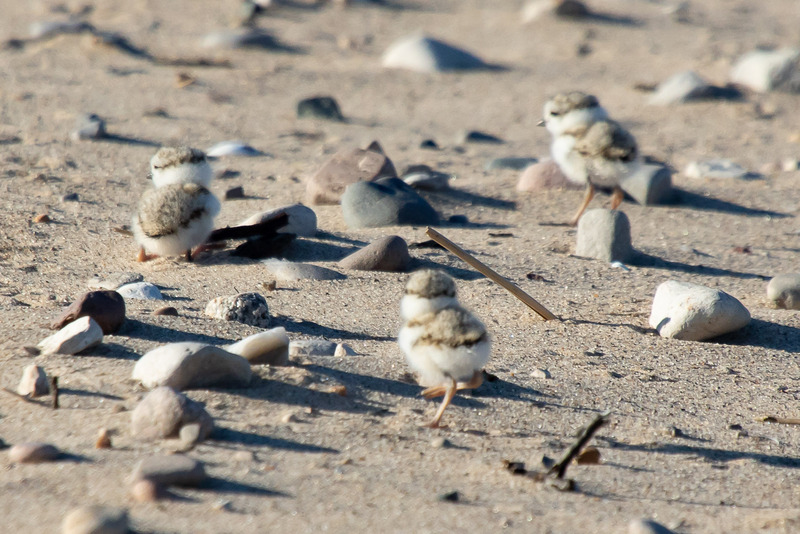 Laugal and Peggy Ridgway for their almost two-month devotion to monitoring the plovers. 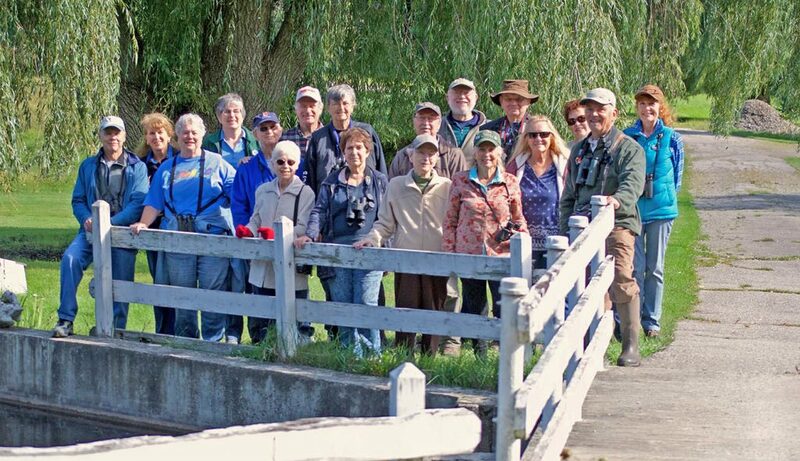 A special thanks to Arno Poerner and condo residents Todd Palgut and Dave Witkowski for their fabulous photos. 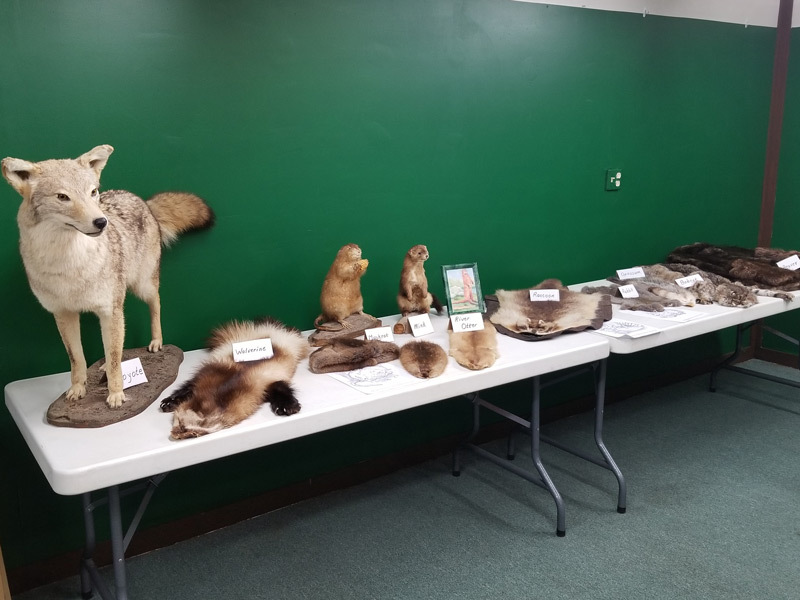 The condo residents are also very much appreciated for their patience and willingness to learn more about this federally endangered species and help this became a success story. 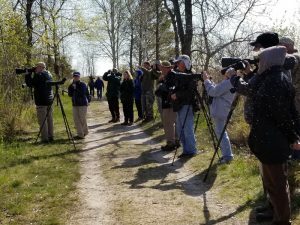 Tawas Point Migration 2018 a Success! 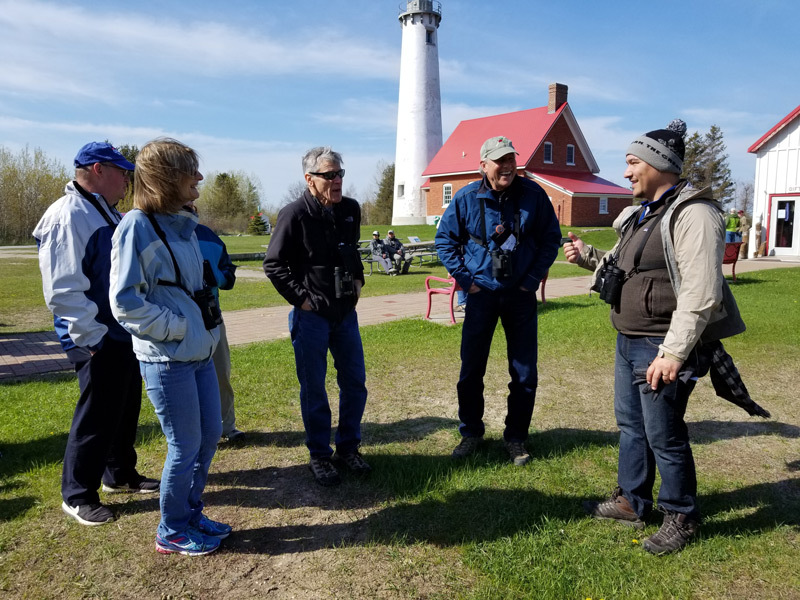 Thank you to everyone who participated or attended the Tawas Point Migration event! Posted in Uncategorized	| Comments Off on Tawas Point Migration 2018 a Success! 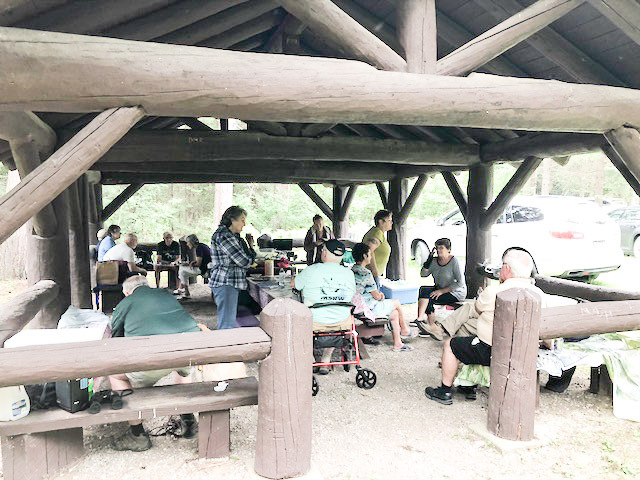 AVA member Bill Roth forwarded this photo taken after the May 8th AVA meeting along with the accompanying description. 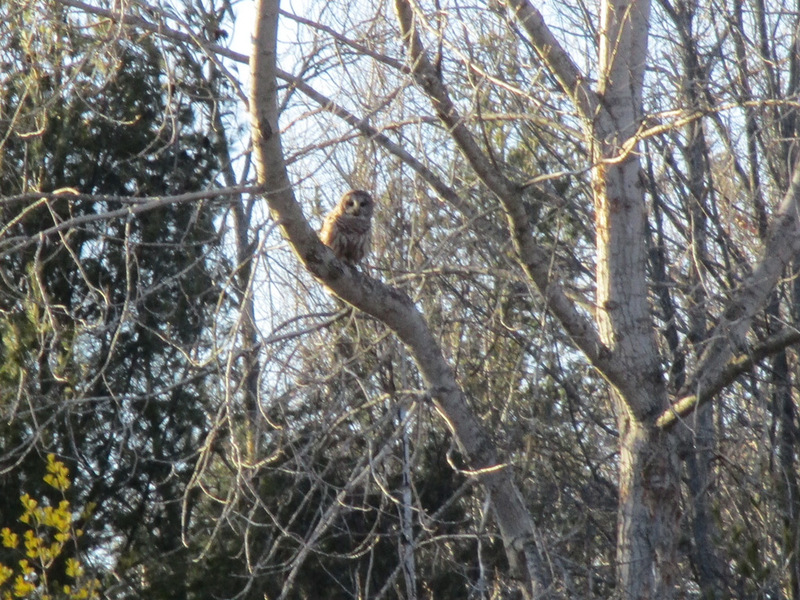 “This Barred Owl was perched in our Aspen tree. It was hunting for squirrels or rabbits that would come to eat the bird seed scattered on the ground by our pond.” Click on the photo for a larger view.